Seth Hale, a mold designer, demonstrates the controls on the Toyo110 injection molding press used to make the medical part described in this article. Photo by Mark Langlois. A Connecticut mold manufacturer digs deep to ask the right questions, learn new technologies, and apply unique methods to solve customers' problems. Smart communications are key to it all. 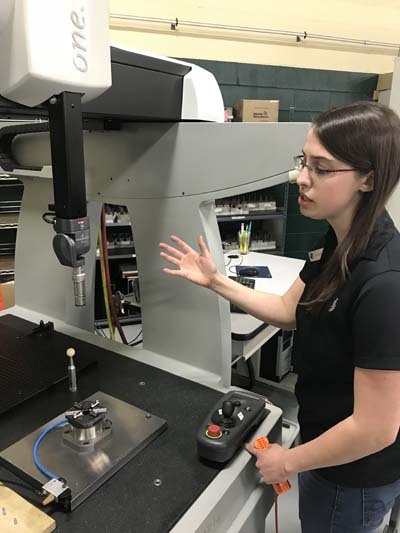 Westminster Tool Inc. employs a "hands-on" approach to working with customers, and by that Westminster means it embraces customers, and makes their challenges Westminster's challenges–all while focusing on continuous improvement and continuous learning. To accomplish that, Westminster trains its employees to be curious: to ask why, and keep asking until they genuinely understand what the customer wants–and to then provide it. For some manufacturers, buying a mold or a tool is a hands-off transaction. Westminster doesn't want that relationship, in part because many mold makers do that. Digging deeper to genuinely help the customer and to build a lasting relationship is something Westminster insists on. Westminster hires people who want a hands-on relationship with customers. Hands-on is "We ask you 100 questions until we genuinely know why you want this tool, and we make you a tool that will perform exactly as you want," said Raymond Coombs, who founded Westminster in 1997 and incorporated it in 1999. "Our greatest strength and key differentiator is our people. Our internal culture and business model enables customers, from the initial quoting process, into engineering and through production, to experience a unique and extremely valuable experience," said Hillary Coombs, vice president, Westminster Tool. "It is largely due to our internal culture of embracing curiosity." Hillary Coombs told a reporter who visited Westminster's Plainfield, Connecticut facility in February that customers are often willing to share information about a part's application with Westminster's designers. There are numerous reasons for this, she said, including the fact that Westminster does not produce medical parts. The company makes injection molds, not plastic parts. It tests its molds by making enough parts to qualify that both the mold and the molding process are producing a part that meets the specification. "Even though we're not competing with them," Hillary Coombs said, "we do have to spend time helping educate some of our customers on the importance of transparency in helping us to help them succeed. We find that if we ask the right question, we get the information we need. We're turnkey." 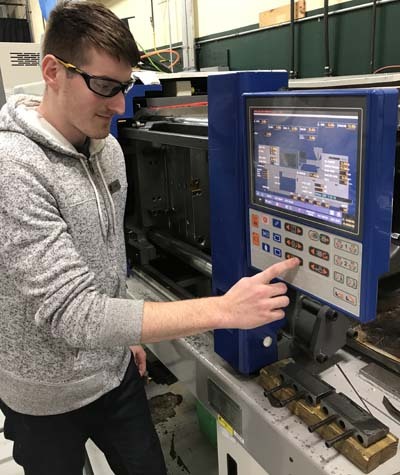 "Turnkey" means that after Westminster finishes building a tool, it runs parts on its own machines until it can tell the customer exactly how to run the tool successfully with respect to time, temperature, and pressure. "They slide this tool in, they press a button, they make a part," Raymond Coombs said. Westminster Tool is located at 5 East Parkway, Plainfield, where it operates a 13,000-square-foot manufacturing plant. It opened a second, similar-sized plant in Sterling, one town over, where it runs the Westminster Academy for training employees and hosts the company gymnasium. It has space there to add an additional production line when needed. It employs four engineers, and 38 people overall. The average staff age is now 33 years old. Before 2013, that number was 54 years old. Westminster Tool produces high precision, tight-tolerance injection mold systems for the medical, aerospace and defense, and consumer packaging industries. The molds are used to make such parts as surgical stapling devices, parts within disposable medical injection systems for diabetes patients, make-up dispensers and packaging, caps and closures for soap and lotions, and high-performance aircraft components. In addition to injection mold systems, Westminster also designs and manufactures resin transfer and compression molds for composite structures. Amy Skrzypezak, electrode manufacturer, describes the electrode shaping and manufacturing process after completing 184 electrodes for a medical part. Photo by Mark Langlois. Westminster does produce injection molded, high-performance thermoplastic components for the aerospace and defense industry. Hillary Coombs said Westminster plans to grow this side of the business due to demands for lighter-weight aircraft parts. To understand the problems a customer faces, Raymond Coombs teaches his staff to dig in and ask the right questions. "What keeps you up at night? What's your biggest challenge? Now we become part of the challenge. We face lots of challenges and that's what's making us successful." A medical customer approached Westminster with what sounded like a challenging medical part. "Our customer needed a solution to a challenge–they needed to produce a medical grade part with a threaded feature that had to be produced in a clean room environment. Typically, threaded features in plastics parts are created utilizing a hydraulically-actuated mechanical action within the injection mold. Hydraulic oils cannot be used in a clean room environment. Therefore, our customer challenged our design team to come up with a new solution," said Hillary Coombs. The customer picked Westminster because it helped previously on another difficult part. To overcome the hydraulic issue, Westminster staff realized the customer would need to use an alternative solution within the mold to create this threaded feature. The Westminster team prides itself on staying informed and being aware of new and enabling technologies within the injection mold industry. They knew of a German company that had a servo (electric) unscrewing technology for injection molds that might work. Keith LeSage, 30-year veteran mold designer at Westminster, incorporated the servo mechanism into the design, and Jason Taylor, a six-year veteran tool maker and CNC operator, taught himself how to use the servo. It involved reading a 300-page manual. LeSage gave Taylor full credit for solving the problem. "Westminster Tool's design team invests in staying up to date and understanding progressive technology advancements within the industry," Raymond Coombs said. "We were aware of a new type of unscrewing mechanism, which was servo driven. This required a small power pack that was added onto the mold, which thus could be used in the clean room environment. As neither company had experience with servo driven mechanical mold actions, our customer depended on Westminster Tool to use our design experience to manufacture a mold around a new technology and further assist them in developing the manufacturing process. This included developing safety protocols, and developing how the work cell would function." "It's not plug and play–it's a German rotary servo," Taylor said. "It advances the core forward and back while rotating the screw threads. It's really accurate, micron precision." In some cases, Taylor would e-mail his contact in Germany and come in the next day to find an answer waiting. "It took two or three days of talking back and forth to Germany to get it right." In addition to the German servo, the work included a Japanese injection molding machine, a Toyo 110 press. The Westminster team made these devices work together. For example, at the same second the injection mold opens to release the part, the servo must unscrew the metal threads at precisely the right turn-rate to avoid damaging the part. During the process, Westminster and the customer agreed to change the material being molded to a polycarbonate that had a higher melting temperature than the original plastic. Taylor, who was speaking to his contact in Germany at the time, was warned to cool the servo controller to be safe. Taylor then added a cooling system to the design. To cut the mold out of steel, Amy Skrzypezak, the electrode manufacturer, had to design, cut, and inspect electrodes for the EDM machines. In all, she and Jayson Taylor had to create about 184 electrodes in at least 40 shapes. To make the tool, Westminster used other machines beyond sinker EDM and wire EDM, including hard milling, soft milling, and grinding machines. The finished mold is a single cavity, class 101 mold, capable of producing millions of parts to a tolerance of two ten-thousandths of an inch (0.0002 inch). "There was a lot going on with this part, a lot of learning going on," Taylor said. Part of the team's communication demands involve not the customer or external suppliers, but communicating properly with "internal customers." Seth Hale, a mold designer who joined Westminster after an internship, said a couple of reasons he picked Westminster for a job was its interest in curiosity and the range of work options open to employees. He said everybody is required to cross train in at least one other job, but the training doesn't stop there. He said they encourage him to ask questions of people in the shop. Hale said when he saw the tool LeSage designed for the medical part, he asked Keith what he'd do differently to make it better next time. "We're pushed here to ask those questions, to be curious," Hale said. "Constant improvement, as well as constant learning." LeSage answered that he would change the placement of the servo to improve efficiency. Having learned how to use the servo, Westminster will be able to design future molds using the technology to assist other customers with similar challenges. "Our designers are not afraid to make recommendations–versus just simply take a drawing and building a mold to fit," Hillary Coombs said. "Many customers choose to work with us simply to have access to our designers and their problem-solving ability." Venturing out of plastic injection molding, Westminster assisted an aerospace company in advancing and improving the manufacturing process and technology for a carbon fiber composite part. The customer knew the process could be drastically improved to increase efficiency, and they knew Westminster Tool had a history of being curious enough to solve an array of challenges. They utilized Westminster to research alternative options for manufacturing, with a focus on heating and cooling options. Westminster (www.westminstertool.com) took its curiosity and mold making knowledge and applied them to this problem. It created the Westminster trademarked Westminster Thermal Management System (WesTempTM). Westminster changed the manufacturing process and invented a heat management system to cut costs. What had been oil heated and cooled, raising the temperature, slowing manufacture, and creating an environmental waste product, Westminster turned into water heating at a lower temperature, which sped manufacture and eliminated any waste oil. "We eventually made a difference for them. We saved them time, waste and space," Hillary Coombs said. "We used our injection molding knowledge and our curiosity-based business model." "Imagine euphoria in manufacturing, where everyone understands each other and respects each other," said Raymond Coombs. "We give them the tools to communicate. We turn conflict into conversation." It's hard to imagine a factory founder taking his company on a whole new direction by asking workers to embrace concepts like "curiosity" and "emotional intelligence." Then add "euphoria" to the mix. Now meet Raymond Coombs, founder of Westminster Tool Inc., a 20-year old mold making firm with 38 empowered employees. "We're investing in people. It's not just about equipment, and resources, and cash, and banks," Coombs said. "Invest in the human being. If you invest in a human, you get the result for years and years and years to come. You want to differentiate yourself in the marketplace? You do it with human beings." Coombs argues that workers who really understand the business through proper training are all pulling in the same direction, and they're pulling the company along with it. They engage and work as a team. The company's basic model: Employees are trained to be better communicators and team members by working on emotional intelligence, continuous learning, continuous improvement, and accountability. When they talk to a customer, they learn the customer's challenges, which they solve with a unique solution that meets and may exceed the customer's expectations. Keith LeSage, a mold designer and engineer at Westminster, said he designs a mold, but workers in the shop shape it from steel and then make it work. When a problem arises, nobody starts the blame game. "It's all hands on deck. There's no asking 'How'd this happen? It's 'How do we fix it? What are our options? Let's get it fixed as soon as possible,'" said LeSage, who has worked at Westminster for 30 years. Vice President Hillary Coombs said LeSage was asking questions, engaged and involved in emotional intelligence long before the entire staff trained. It's a concept the company has always embraced but had never utilized as a foundation for a business model. Raymond Coombs invested $600,000 in training his workers to lead Westminster into the future. He bought a second building in 2014, where the company established the Westminster Academy for employee training and a gym. While extra space in the new building awaits another manufacturing line when needed, Coombs stresses the importance of investing in Westminster's people. "It's not just about what you teach them on a machine, but also what they have in their hearts. Making sure they have the heart and same integrity and values that we stand for is important," Coombs said. The American Mold Builders Association (AMBA) recognized Westminster for its leadership in education last year, naming the company the winner of its 2017 Tooling Trailblazer of the Year Award. Westminster sponsors or engages in numerous educational programs, including a makerspace at Moosup Elementary School, the Westminster Tool Shadow Program, the company's Annual Open House, and a "Learn While You Earn" scholarship. The company also participated in a local high school's "Mock Interview Event," the Connecticut Early College Opportunity, the Eastern Advanced Manufacturing Association Video Challenge, and legislative advocacy for manufacturers. Another reason Coombs needs to focus on training is that it's as hard to find quality manufacturing workers in Eastern Connecticut as it is nearly everywhere else in the country. The AMBA picked Westminster for the award because of the company's outreach and educational efforts. Coombs also thinks teaching workers to be better communicators, to find a problem curious rather than enraging, is required in manufacturing. Along his journey to re-imagine Westminster, Coombs flew to Germany to tour a few world-class manufacturing firms. He learned that Germany's manufacturing culture insists on continuous learning. A worker who starts in manufacturing is likely to continue taking training courses, certificate programs, or enter college during their working career. Coombs embraced that for his own employees. He also studied Japanese manufacturing, and he embraced their concept of continuous improvement. Continuous learning, continuous improvement, and accountability became Westminster's mantra. One outcome of this change at Westminster: The average age of workers in the shop fell from 54 years to 33 years from 2013 to 2017. Coombs said it was hard to tell an old friend who was hired because he wanted to be the best toolmaker that a change was needed. He wanted them to stay and embrace change. Older workers didn't sign on to the idea of "emotional intelligence." "The older generation doesn't want anything to do with it–they don't want to hear about emotional intelligence. That was hard; I felt terrible about that," Coombs said. "I want everyone from the veteran to the rookie to own the process from the beginning to the end. We don't want to just knock out molds with a hands-off approach." "What if you had a company where everybody understood and respected each other and knew what they were fighting for every day?" Coombs continued. "What if they had the tools to communicate more effectively? Where you take conflict and turn it into curiosity? Imagine if you had 40 people running your company today and everyone understood what they were doing instead of only one? What if they were doing it at speed?" At Westminster, each worker is given a personality profile using the DISC system. DISC divides personalities into four groups. A person who is designated "D" for drive, is likely to be physically active, direct, decisive, a self-starter, and is driven. That person wants results. The downside of the "D" person is they can be impatient, argumentative, and insensitive. The workers designated "I" are people who tend to be sociable, optimistic, collaborative, and fun. They like to influence things. The downside for the "I" people is they can be disorganized and impulsive, and lack follow-through. The "C" person is a rule follower who is systematic, accurate, analytical, and conservative. Their downside is they can be critical, sarcastic, cautious and isolated. The "S" designation is for people who are steady, considerate, patient, and supportive. Their downside is they are more likely to be indecisive, sensitive, and unassertive, and they may hold a grudge. Hillary Coombs said the importance of the DISC profile is that it is a positive tool when everyone knows each other's DISC designation, and can better understand how to approach each other. If you want a task done this morning, bring it to a D person. If you want to know about compliance and rules, take that question to the C person. If you're talking to an S person, help them overcome their indecisiveness by giving them all the information they need. "Our unique employee centric business model has helped us grow from a single person operation to a world class manufacturing firm with 40 employees. The business model focuses on giving our employees the interpersonal and technical tools to help them succeed," Westminster Tool says on its website. To help workers with the transition, Westminster's library includes these books, "The Speed of Trust," Stephen Covey; "Raving Fans," Ken Blanchard, Sheldon Bowles; "Emotional Intelligence 2.0," Travis Bradberry, Jean Greaves; "What Got You Here Won't Get You There," Marshall Goldsmith; "Search Inside Yourself," Chade-Meng Tan. John Beauregard, president and CEO of the Eastern Connecticut Workforce Investment Board, manages the federal and state partnership with manufacturers that cooperate to train and provide workers to employers east of the Connecticut River. Beauregard and Coombs work together on developing the workforce. "Success in workforce development depends on getting leadership from the employers themselves," Beauregard said. "That's why Ray is the gold standard in Eastern Connecticut." In addition to what Coombs is doing for Westminster employees, and in addition to working with Beauregard's Workforce Investment Board, Coombs also founded the Eastern Advanced Manufacturing Alliance, to strengthen regional advanced manufacturing in eastern Connecticut, northwestern Rhode Island, and south-central Massachusetts. The alliance works with high schools, technical high schools, and colleges to introduce students to manufacturing careers. The alliance started with six members and now has 70. Its four priorities are increasing awareness of manufacturing careers, improving manufacturing education in secondary and post-secondary schools, advocating for advanced manufacturing and educational programs that support advanced manufacturing, and sharing best practices for workforce development. Westminster paid for, sought grants for, and helped establish a student makerspace program at Moosup Elementary School, now in its second year. "For small to medium-sized manufacturers, it's difficult for them to get the training and education providers to take an active role," Beauregard said. "The range of industries is too broad. But Raymond Coombs at Westminster helped bring all the people working in employee training together, including veterans, the state Department of Labor, the state Department of Economic and Community Development, state technical schools and community colleges. He focused education on advanced manufacturing and employee training. The leadership of people like Ray has made a difference in the community."